Making rosemary skin oil at home is simple, and requires no more than fresh rosemary, oil and warm sunlight. The sweet, aromatic rosemary oil may benefit your skin in several ways. Although rosemary has not been extensively studied, the herb may stimulate circulation and contribute to a youthful, vibrant complexion. According to Maria Lis-Balchin, author of "Aromatherapy Science: A Guide for Healthcare Professionals," the oil is gentle enough for sensitive skin and works as a powerful, nonirritating astringent for oily skin. 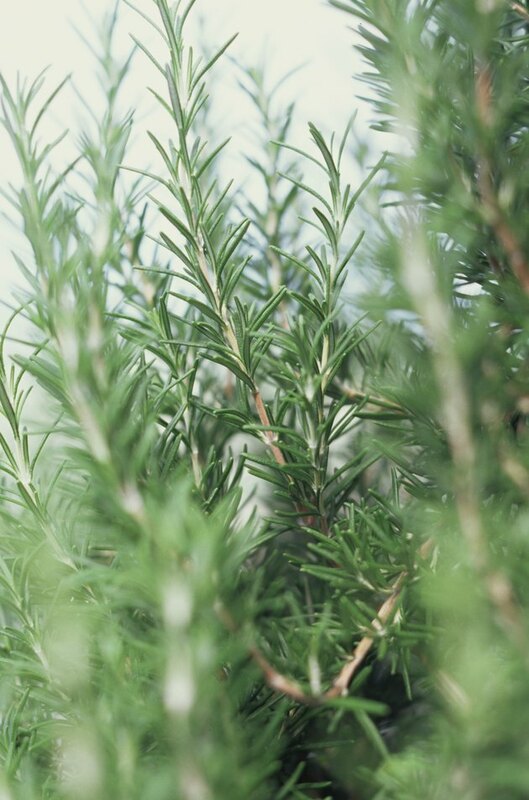 Allow fresh rosemary to dry in a warm, dark area overnight to allow excess moisture to evaporate. The rosemary will appear slightly wilted. Fill a glass jar about two-thirds full with rosemary, with the rosemary relatively loose and not tightly packed. Cover the rosemary with high-quality extra virgin olive oil so the herbs are completely immersed with no part exposed to air. If you prefer, you can use apricot, sunflower, grapeseed or almond oil. Stir the mixture gently with a wooden spoon to remove air pockets. Cover the jar tightly and place it in a warm location where the oil is exposed to sunlight for most of the day. Leave the jar for two to three weeks. Shake the jar gently every day, but be sure the rosemary remains submerged in oil. Strain the mixture through a piece of clean muslin to separate the herbs from the oil. Squeeze the cloth gently to remove as much oil as possible. Repeat two or three times, or until the oil is clear. Pour the rosemary oil into a sterile glass jar. Cover the jar and place the oil in a cool, dark place. Let the oil rest for a week to allow water and impurities generated from the plant material to settle at the bottom of the bottle. The oil that rises to the top will become rancid if the dirty water isn't removed. Carefully pour the clean oil into a sterile, amber glass bottle and discard the dirty water. Cover the bottle securely. Store the rosemary oil in the refrigerator, or in a cool, dry location. Fill the bottom of the double boiler with water. Bring the water to a boil; reduce the heat until the water simmers gently. Place a large handful of rosemary in the top of the double boiler. Cover the herbs with extra-virgin olive oil, or use apricot, sunflower, grapeseed or almond oil. Cover the double boiler top tightly and place it over the simmering water. Place a candy thermometer in the rosemary and oil. Adjust the heat as needed to keep the temperature at about 120 degrees Fahrenheit. The oil should be warm but not hot. If the oil begins to simmer, lower the heat. Warm the oil for at least 30 minutes, stirring occasionally with a wooden spoon. The longer the oil warms, the purer it will be. However, be sure to watch the oil closely so it doesn't overheat. Strain the mixture through muslin into a clean glass jar. Let the mixture stand, undisturbed, for a week to provide time for water and impurities to settle at the bottom of the jar. Pour the oil carefully into a sterilized amber glass bottle. Cover the bottle and store the oil in a cool, dark place, or in the refrigerator. As with all homemade skincare products, test the oil on a small spot of your skin before using it.